Nvidia introduced on the Mobile World Congress (MWC) , its future work map for the mobile Chipsets , with lot of performance coming to the mobile world. 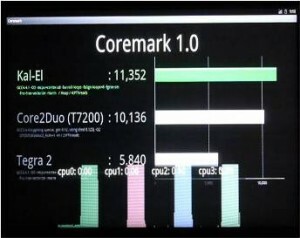 Lets begin with the Tegra 3 codenamed Kal-El which will take it place on the tablets this year , the Kal-El Tegra 3 (from the super man character Clark Kent) is a quad core using 28nm technology and is five times faster than Tegra 2 , even slightly faster than a Core 2 Duo . 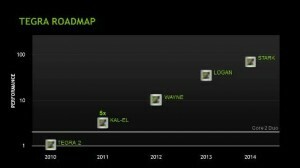 Next is the Wayne Tegra 4, this one will be 10 times faster than Tegra 2 and will be available on 2012 , and in in 2013 Tegra 5 codenamed Logan will hit the markets with up to 50 times faster than Tegra 2 and finally after three years from now in 2014 Nvidia plans to launch an extreme faster mobile GPU codenamed Stark which likely the Tegra 6 and this chip has a performance of 100 times faster than the current Tegra 2 core.